A project that led to the discovery of a potential new antibiotic capable of beating antimicrobial resistant bacteria including MRSA has won the overall prize at this year’s BT Young Scientist and Technology Exhibition. The study by 15-year-old Simon Meehan from Coláiste Choilm in Ballincollig in Cork investigated the antimicrobial effect of parts of selected plants against the common bacteria Staphylococcus aureus (SA). For his prize the transition year student takes home the perpetual trophy, a cheque for €7,500, and a trip to Bletchley Park. He will also represent Ireland at the 30th EU Contest for Young Scientists, which takes place in Dublin this year. Simon collected samples of the aerial and root parts of ten common plants in 40% ethanol. They were then tested for their antimicrobial effects on the bacterium Staphylococcus aureus. It is commonly found in the nose and on the skin of many healthy adults but some strains are resistant to antibiotics and can cause serious illness if they infect the body. Through independent testing, Simon found two extracts were effective in killing an antibiotic resistant strain of Staphylococcus aureus, MRSA. In particular, the results showed a high level of susceptibility of SA and MRSA to aerial and fruit parts of Bramble and to the root extract of Mare’s tail. "These are organic, they don’t harbour any toxicity that you may get from industrialised antibiotics," he said. "So to keep it as organic as possible in the future would be possibly the most fantastic thing, especially because antibiotics are very specific in what they do, whereas a plant may have many constituents that the bacteria will have to adapt to." On the basis of these results, further plant extracts were also analysed. Simon is now awaiting a patent on the extraction method for Bramble that can lead to its use as an antimicrobial. "There are so many places I can go with this," he said. "What really gutted me the whole way through the project was that I can’t take all routes I want, all trials and test everything because of time constraints." 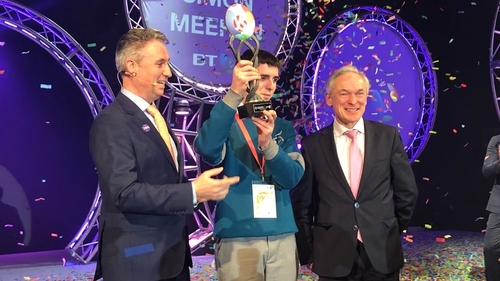 The award for best group went to 16-year-olds, Oran O’Donoghue and twin brothers James and Harry Knoblauch from Coláiste Bhréanain, Killarney Co Kerry. Their project was an investigation into conformity and how minorities can influence it. They found that there is a fairly consistent rate of conformity of 40% but an individual can cause significant numbers in a group to conform to their actions, impacting on decisions. They also found people are embarrassed about conforming and often appear to be unaware that they have conformed. The overall individual runner-up prize was won by Claire Gregg from Loreto College St Stephen’s Green in Dublin. She carried out an analysis of the housing shortage in Ireland using agent-based modelling. The overall runner-up group prize was collected by 16-year-olds, Darragh Twomey, Andrew Heffernan and Neil O’Leary from Coláiste Treasa in Kanturk in Cork. They discovered that the common natural bacteria found in plants, Pseudomonas Fluorescens, could be used to markedly increase the yield of certain barley crops. This, they predict, could make it a low cost easy method of increasing food production in parts of the world where there is food poverty. More than 550 projects were shortlisted to take part in this year’s exhibition, with over 1,100 students involved. More than 60 judges were involved in deciding the winners of the more than 120 prizes. The exhibition is open tomorrow from 9:30am until 5:30pm.